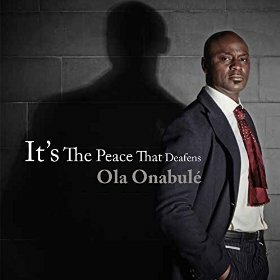 Ola Onabule said that It’s The Peace That Deafens, his follow up to the brilliant Seven Shades Darker, is the result of a process that found him taking full ownership of the African-ness in his background. In prior years, Onabule, who was raised and educated in Nigeria and Britain, believed there was an imbalance in his life that caused him to respond more to western music – despite the fact that the music of the African continent and Nigeria served as the soundtrack of his formative years. It’s not as if Onabule avoided addressing African themes and issues musically. Seven Shades Darker included the tune “Great Expectations,” a timely piece about a boy who flees his war torn homeland in search of security and prosperity. The absolutely lovely and powerful “A Name” poignantly describes how something as simple as a name can determine whether a person lives or dies in countries riven by ethnic or religious strife. Yet, those tunes didn’t contain the rhythms, cadences or percussive energy of his homeland to the extent that those elements come to the fore on the present project, and Onabule said that it was a visit from his parents during holiday that prompted him to explore the music that had more of an African based folkloric sound to it. The differences are apparent, but they are also nuanced. There is polyrhythm and of course there is percussion, and the manner in which Onabule employs these flourishes does set It’s The Peace That Deafens apart from a project such as Seven Shades Darker, which is an R&B and pop project – albeit an extremely well made R&B and pop project. Nowhere are those stylistic and substantive differences more apparent than on “Jankoriko.” Many SoulTrackers have probably viewed the video for “Jankoriko,” which tells the story of a man who is executed for stealing food. The animated video features the animated and features the silhouette of a man – who appears to be headless - running through a city. That track features syncopated hand claps that provide the percussion that migrated with Africans to the Americas and to European Continent. Percussion stands as the recurring theme in African based music. The drum has long been used as a form of communication, and Onabule makes frequent use of all types of percussion on It’s The Peace That Deafens, such as the talking drums that appear to be engaged in a conversation with the piano on the tune “Patience Endures,” while the back-to-back tracks “Voodoo” and “Invincible” find Onabule fusing New Orleans styled shuffle percussion rhythms and Afro-Caribbean swaying melodies with jazz improvisation. Onabule has a demonstrated ability to create ballads that are absolutely mesmerizing – check “Let Love Alone” and “Sanctuary” on Seven Shades Darker - and the title track, with its sparse and pensive piano jazz arrangement augmented with the deft use of brushes on the drums, delivers another standout slow jam. Onabule took a risk when decided to incorporate the rhythms of his homeland into the music heard on It’s The Peace That Deafens. He deviated from at the straight forward R&B sound that not only served him well on his previous albums, but had been successful for other Brits such as Sam Smith and Adele. Of course, Onabule is accustomed to taking risks. He turned his back on a law career to pursue his music dream and started his own label to ensure that he remained true to his vision. It remains to be seen how fans respond to his artistic turn, but the growth of his expression on this new album will be a treat for those who check it out. Solidly Recommended.